The largest selection of sensors and sensor accessory products worldwide is manufactured by PCB®. Products include sensors for the measurement of acceleration, acoustics, force, load, pressure, shock, strain, torque, and vibration. All are backed by our Total Customer Satisfaction policy. 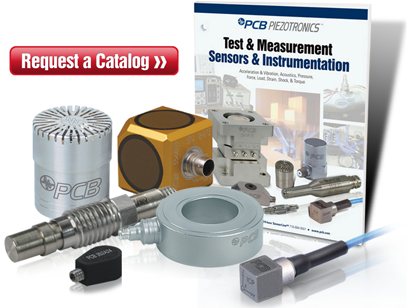 Since 1967 PCB has been a premier supplier of precision sensors and instrumentation. Our Design, Engineering, and Production teams draw upon state-of-the-art manufacturing capabilities to continually provide better sensing solutions. PCB offers unmatched customer service, a global distribution network, 24-hour SensorlineSM, and Lifetime Warranty to deliver our promise of Total Customer Satisfaction.